The TM4 has been designed to work on with our UH8 and DS-SB Setback Thermostat, and offers a highly effective, simple to use control system. The Touchscreen interface makes programming switching times in the TM4 simple with no need for the user manual. 4 Zones The TM4 offers control of 4 zones, each zone with their own individual time settings. From Towel Rails to Lighting All time clock models can be used to control anything – not just your heating system. + Boost Facility This programmable function allows you to extend the program time in 30 minute increments – ideal for unscheduled operation of the system. 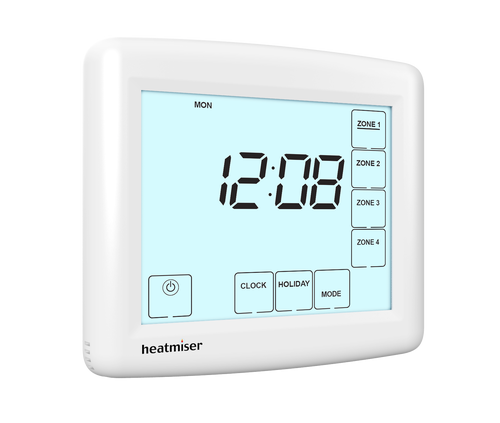 4 Switching Times 4 On/Off times are provided on all time clock models, allowing flexible control of your heating system.